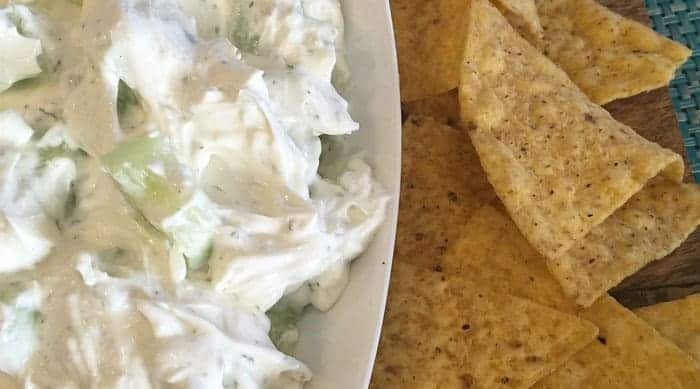 Creamy cucumber dip is such a simple recipe full of flavor. 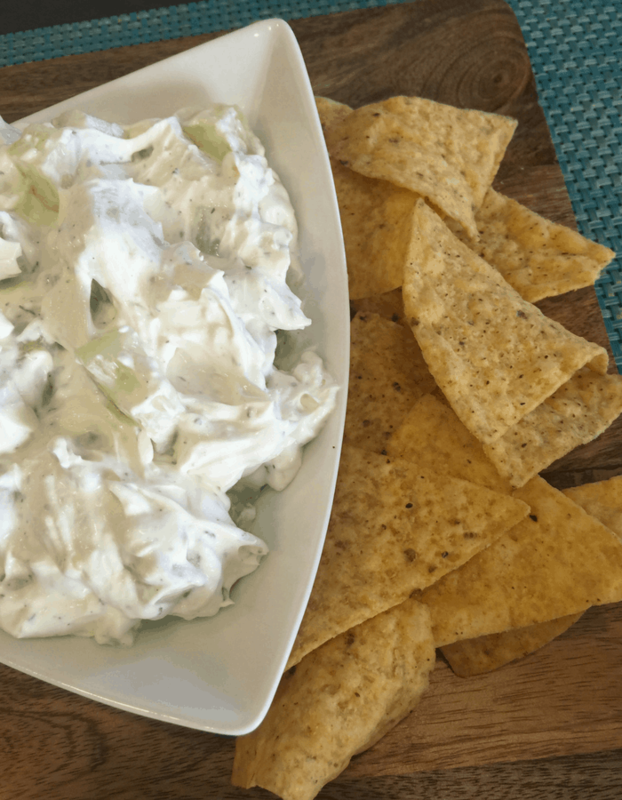 This creamy dip pairs great with tortilla chips, pita chips or more veggies. The perfect go-to recipe for last minute get-togethers. I’m really excited to share this recipe. It’s one of my favorites all the way back to my college days. Looks can be deceiving a little bit as it looks really basic, but it is packed with flavor. It is so simple yet so delicious. My family goes crazy over cucumbers. Cucumbers with salt is a snack favorite at our house. 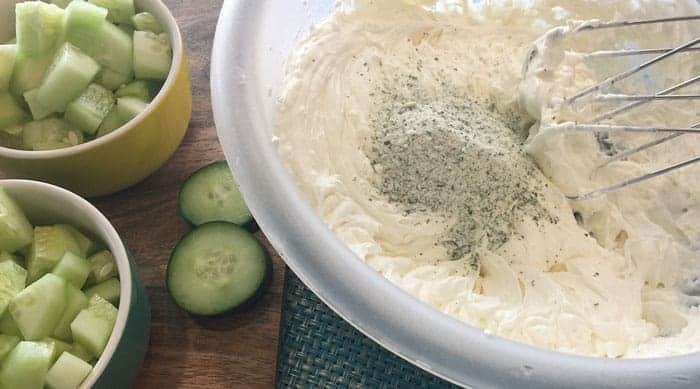 Naturally, they like this cucumber dip as well. But who I am kidding, as long as my kids can dip — they’ll pretty much eat anything! It’s my go-to recipe when our family is invited to a BBQ last minute. You can pair it with tortilla chips, pita chips, crackers, or more veggies. Our favorite is tortilla chips! 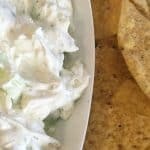 This dip takes 15-20 minutes to prepare and feeds about 10-12 people. First, I like to set the cream cheese out to soften and then get the chopping out of the way. Chop both cucumbers into large chunks and set aside. Next, add the cream cheese to a medium-sized mixing bowl. Make sure it is softened or your dip will end up chunky. You can even pop it in the microwave on defrost if needed. Mix until creamy. I use my hand mixer to blend. One day I will have the teal Kitchen Aid Stand Mixer, but I haven’t splurged yet! Add the sour cream and blend until very creamy. Next, add the package of ranch dip seasoning. Mix well. Add the chopped cucumbers. Refrigerate until you are ready to serve. To serve, add the dip to a fun serving bowl and pair with tortilla chips. 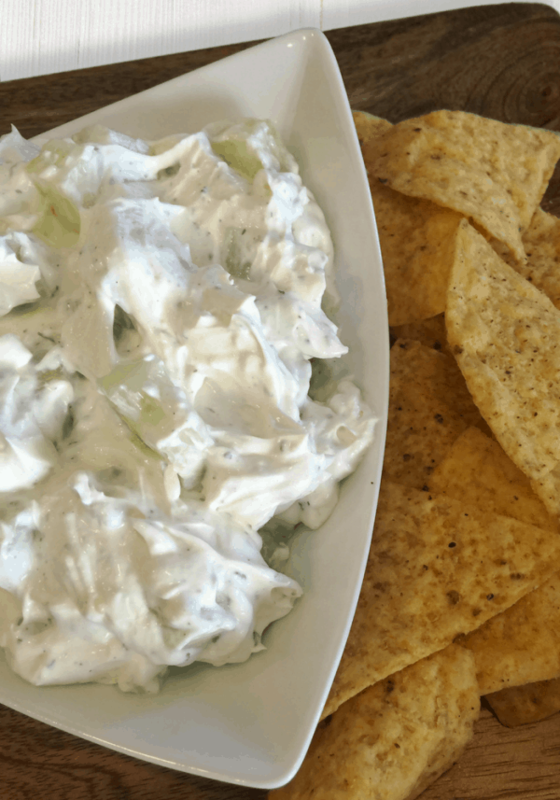 Creamy cucumber dip – super easy and so flavorful. Set the cream cheese out to soften. Chop the cucumbers into large chunks, set aside. 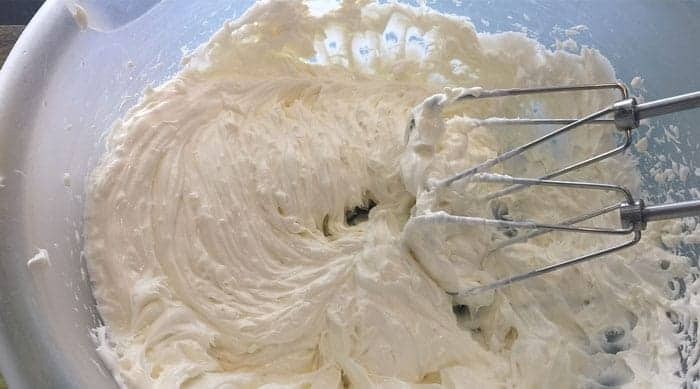 Once the cream cheese is soft, add to a medium size mixing bowl and use a hand mixer to blend until creamy. Add the sour cream and blend again until silky smooth. Add the ranch dip seasoning packet and mix well. Add to a serving dish and pair with tortilla chips, pita chips, crackers or veggies. This dip is best served the day you make it. The cucumbers can cause the dip to get watery when left to set overnight.